Potentially, you will have more privacy. If the home sits on a sizeable lot and is well buffered from neighboring properties, you might have excellent privacy and be able to sit naked in your hot tub without a care in the world! Castles were usually built on top of hills for a reason so they could see their enemy coming and the enemy would have to fight their way up. So it rampaging Vikings ever show you’ll be ready. OK, I admit, I’m struggling to come up a with more pros. Maybe it gives you a subconscious sense of security being up higher like driving an SUV? Because of the unique terrain theses home sit on, combined with what is know as gravity, the list of cons can outweigh the pros for steep slope homes. 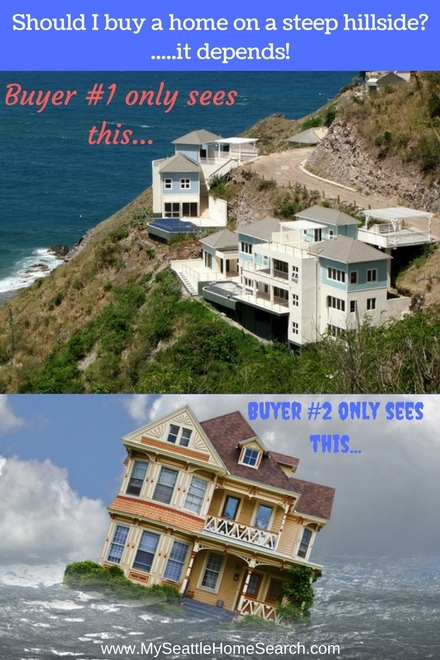 Resale value / sale-ability: because many buyers will perceive homes on steep slopes as a risky investment, it may be harder to sell the home plus potentially the home could appreciate more slowly than comparable flatter terrain homes. However, those homes with spectacular, panoramic views can easily distract buyers from any potential issues the home and lot might have. It’s a scientific fact, water runs downhill and water really, really likes steep slopes. You have to be extra aware of how rain runoff is controlled on the property. If the home is built on solid rock, who cares! But if the home is built on a slope of tress and vegetation then the home must have good drainage systems in place that prevents water from (1) getting into the home and (2) eroding the soil and making the hill unstable. Bad drainage equals an increased risk of land / mudslides and damage to the home. Visit the home both during and after heavy rainfalls to see how the property handles rain runoff. On a dry day it might look fine but resemble Niagara Falls on a rainy day. Rainy days can also help you discover other issues with the home including water in the basement and crawl spaces. You can’t control what the owner above you does. Although the property you are considering buying might have effective drainage systems in place, you have no control over what a higher up neighbor does with their water runoff. Wet, dense soils on the uphill side of the home’s foundation can exert a lot of force on the uphill foundation walls of the home – and becomes like like a dam holding back a lake of mud. That’s why a retention wall between you and your elevated neighbor is a good idea. In 2007, 47 Seattle homeowners sued both the City of Seattle and the owner of home at the top of the hill for causing a landslide that year. Higher homeowners insurance premiums: Regular home insurance will cover items like fire, contents and liability, however when buying a steep hillside home, be prepared to potentially pay a lot more hazard insurance. Even more so if the home is located in a known landslide area. In addition, most of those policies just protect the home, not the land the home sits on. Usually, you will have to get what’s referred to as a “difference in conditions,” or DIC, policy. This covers insurance against mudslides, landslides and earthquakes. But it's not cheap. Can cost an additional $500 each month! Even then, most slides usually stop when they get to the home's structure. You pay all that extra money on insurance but the hill / land is not covered by the insurance, just the home. Repair costs for the actual land can be very expensive, even in the $50, 0000 and $200,000 range! Expensive preventative measures: Landslide insurance can be hard to find in high-risk areas so that engineering solutions may be the only option. These can be very expensive if not already in place. You might have to spend thousands of dollars on systems to stabilize the property such as adding retaining walls that will hold back any movement above or below the home. You may also have to add drainage systems to ensure water is diverted away from the foundation of the home (especially the side facing the hill). You need to control both surface water and the more expensive proposition of controlling sub-surface water. Also, you have to be aware of using the right plants and vegetation to help controls soil erosion and water runoff. Homes on hills require more inspections: if you are considering buying a home on a slope, make sure to select an experience inspector who is familiar with these types of homes and knows what to look. Learn how to find a trustworthy home inspector who can save you from buying a lemon. In addition to a regular property inspection, you must also have the home and lot inspected by a geotech engineer, even if the main inspector doesn’t find any issues. The engineer will be more trained and experienced at discovering any tell tale signs of gravitation pull and if there is any evidence of past landslides. Finally, make sure you inspect the sewer line by running a camera down the line (sewer scope). The sewer line will be running down the hill and any shift in the land can break sewer connections. It's $250 well spent! Livability issues? : the home will likely have a steep driveway. On icey and snowy days, you might not be able to dive out of, or up to the home. Be prepared to work from home or remember to park your car at the end of the hill overnight. If snow is common in the winter months, is the home located in an area that will be snow plowed or will you be responsible for taking care of that. As you get older, that steep driveway and hill may become a hassle to negotiate everyday. Or you feel like you are scaling Mt. Everest every time you have to take the dog for a walk. Home located on steep hillsides may have limited natural light. Although the home may be facing directly east and get beautiful sunrises, come 2pm, the sun is gone around the back of the hill and the home sits in shade complete for the rest of the days. As with any home, if sunlight is import at to you, make sure the home faces in the direction you want... are you a morning or an afternoon sun person? Limited or no yard space: If you are looking for a home with a big yard, these are not the homes for you. Most likely you with either have a very steeply sloped yard or a couple of small terraced spaces. Most of your outside living will probably be done on the deck. Less privacy: there might be a home directly on the same level as you with their deck also facing down the hill and because of the steep slope, there are no dividers between you and them….. like dining al fresco with you neighbor on different decks. For cookie-cutter housing developments, it can feel like you are packed in like sardines and living in a fish bowl…homes above and below you, home to the left and right of you. You sit in your backyard and exchange glances with the neighbor behind you sitting on their deck. 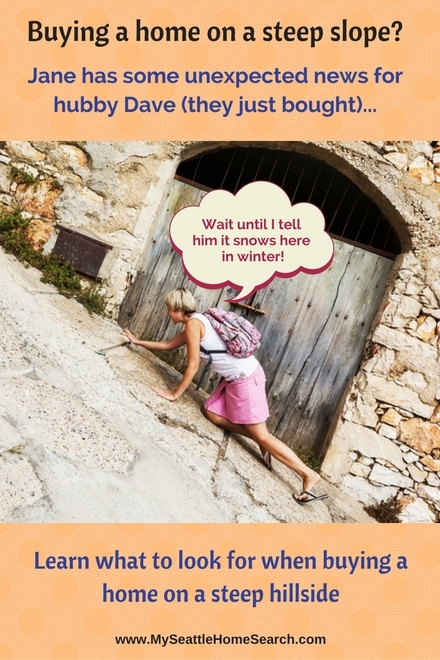 Warning signs to look out for when considering buying a home on a steep hill. When out viewing hillside homes with your realtor or doing an inspection with the property inspector, here are some red flags to keep an eye out for that might be indicative of a risky purchase. Note that even in homes that are located on level lots you will see some of these defects, but in the case of steep hill homes they may be more pronounced and potentially add to up to a bigger, a cumulative problem. Do you see any cracks in the ceilings or walls, any cracks radiating out from the corners on the windows or are there any cracked window panes. More importantly are there any large cracks in the foundation or cracks on the exterior walls? Take that high tech buyer gadget called a marble, place it on the floor and see if it starts rolling towards the side of the home facing the hill. Note that even in older Seattle homes from the 1920’s etc built on level lots will have some settling over time and will fail the marble test. Do the doors swing open or close (by themselves) in the direction of the slope or is it difficult to open and close the doors (getting wedged in the door frames). Take a look at the top of the door and see if it has been shaved a few times to makes the door close more easily. Does the basement or crawl space have any water intrusion issues? Does the lot have any water drainage problems? Are there any large cracks in the driveway? If the owner is "selling the home as-is" you may want to be extra cautious. The seller might not have much faith in the home passing an inspection or is tired of pumping money into the home or reinforcing the lot. 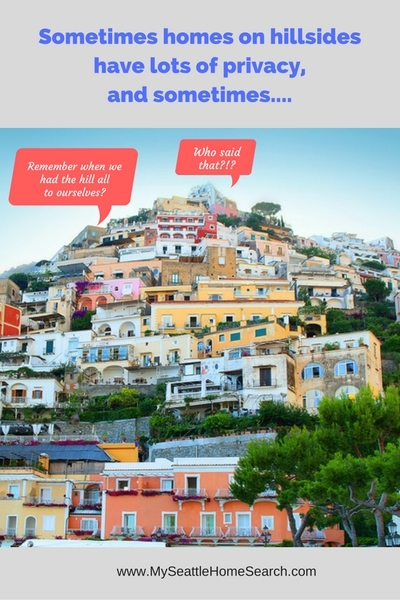 So should you avoid buying a home on a steep hillsides? Absolutely not! You just need to do additional homework and research to protect yourself compared to buying a spirit-level home. And just like all homes, some homes on steep slopes are good and some you shouldn't touch with barge pole, not matter how great that breath taking the view might be. Better to have you breath taken away by the view rather than by your new home making it's way down the hill!